1. What prompted you to seek out RTF Sod? What situation or problem did you need to solve? 2. What are the two most significant improvements that have resulted from your experience with the RTF Sod? I understand that the testimonials, photos and videos that I submit on this website on behalf of RTF Turf Producers Association and its members may be used in connection with publicizing and promoting the RTF Sod brand. I authorize the RTF Turf Producers Association to use my name, brief biographical information, and the Testimonial as defined on this form. I hereby irrevocably authorize the RTF Turf Producers Association to copy, exhibit, publish or distribute the Testimonial for purposes of publicizing the RTF Turf Producers Association programs or for any other lawful purpose. These statements may be used in printed publications, multimedia presentations, on websites or in any other distribution media. I agree that I will make no monetary or other claim against the RTF Turf Producers Association for the use of the statement. In addition, I waive any right to inspect or approve the finished product, including written copy, wherein my likeness or my testimonial appears. I've planted seed and sod lawns (etc) for years. This is the best color, sustainability, disease resistant, and overall performance in a fescue I've ever had. My clients want landscapes that use as little water as possible. Reducing chemical use and time spent on maintenance are desired as well. Traditional lawns are very greedy. Our clients are using less and less water over time. We also get very few Spring callbacks looking for overseeding. I have found RTF to be a superior lawn, and my clients respond positively to us recommending it. Our front yard had old tired bluegrass that was thinning out horribly. We also had a tree stump and outdated bushes and plants where you see the wheel barrel. We stripped it all and installed RTF Sod. Can you say gorgeous?? 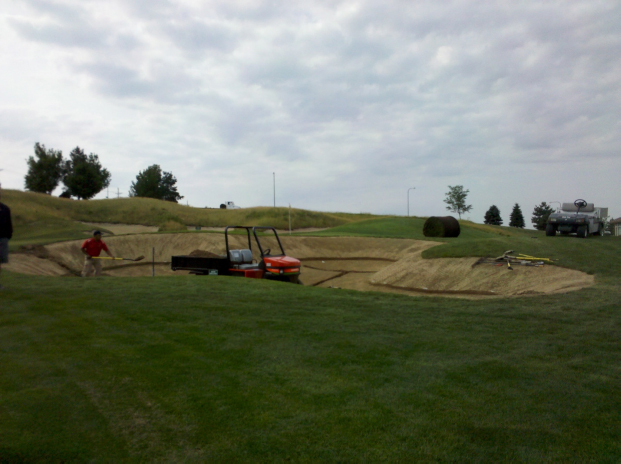 Our RTF tall fescue sod is becoming increasingly more popular for bunker renovation projects. RTF is being selected for increased drought tolerance, reduced thatch production, and distinct appearance. The Omaha Country Club hosted the 2013 U.S. Senior Open. 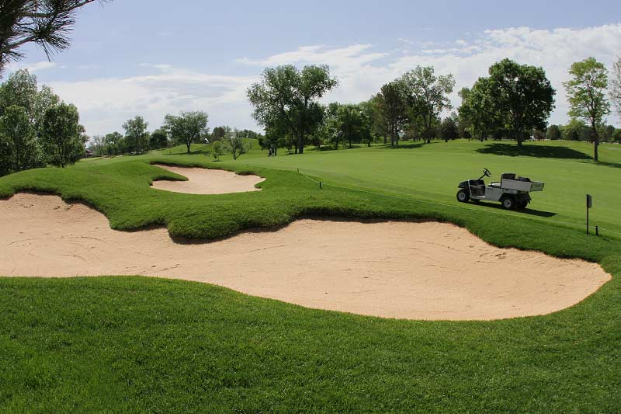 RTF Sod was used on the bunker faces and some of the surrounds and outside boundary areas at the Omaha Country Club. It was held in July and water was shut off to most of the course in order to host the event. The RTF held up well and was a beautiful dark green color on the bunker faces. When I first learned of RTF, I was skeptical at best, but willing to try anything in the shade under the burr oaks that produced nothing more than mud in my yard. The RTF was not only the perfect solution for that area, but I am now living with the value of the low water requirements of the RTF. My house backs to a large treed park. The lawn is so beautiful even the parks personnel comment on it. We have been redesigning bunkers on our course this past year. Our choice of grass for our new bunker faces is RTF. The reason for using RTF is because it tolerates the heat and uses less water than other turf varieties. 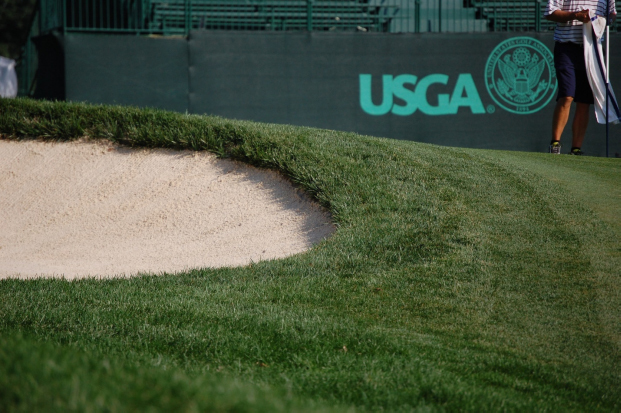 RTF’s rhizome production also holds up on the bunker faces compared to other Tall Fescues. I have really enjoyed your RTF Product. I am still the envy of the neighborhood and have been told our lawn looks like Wrigley Field. RTF is not Your typical Tall Fescue. A few months ago I re-sodded my yard with RTF tall fescue from Kuenzi. 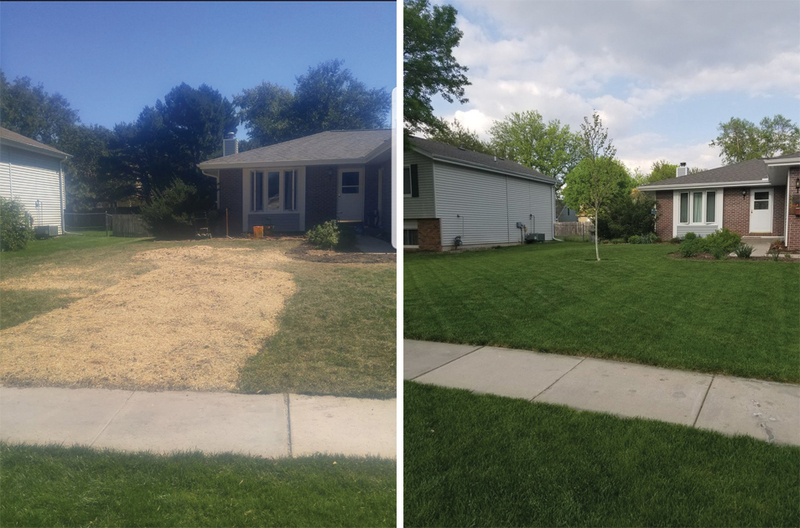 As a contractor I've used tall fescue blend seed before and found them slow to fill in a lawn, even when over applying seed by a factor of three. So when I did my own yard I thought I'd try RTF sod and I'm glad I did. The sod was thick, strong, flexible, and cut in perfect rolls. It went down flawlessly. After a few months and a little fertilizer, it looks fantastic - even with heavy use by pets and kids. Lots of random people walking by complement it. It's easy, durable and good looking. What more could you want. 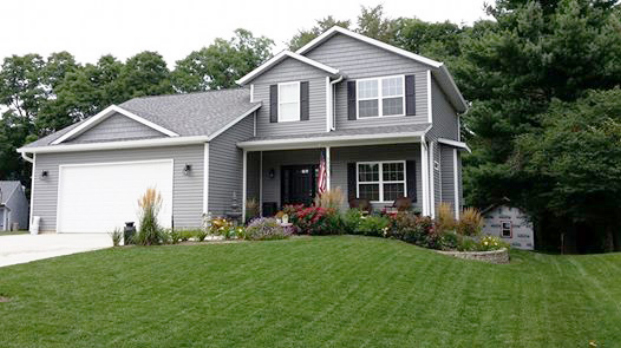 The newly sodded front yard has transformed the look of the whole home. The installation team was knowledgeable, professional. The RTF is everything you said and more, thick, hearty, soft and a beautiful deep green. Thank you for a wonderful experience and the beautiful front yard and we are anxiously awaiting getting the backyard done this spring!! 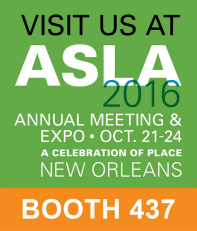 Make sure to stop by and see us at booth #437 at the ASLA show in New Orleans. A major point of discussion with natural turfgrass systems is the amount of water required to irrigate. Most water overuse is due to human error or miscalculation. Understanding and following proper irrigation practices will lead to water conservation. Water conservation can also be achieved by using a drought tolerant turf, such as the ones used in the RTF Sod blend. Also by encouraging deeper rooting of turfgrass cultivars like the RTF Sod by watering deeply and infrequently. Copyright © 2019. RTF Turf Producers Association. All rights reserved.